One of my most vivid memories of growing up was the drive home from the movie theater after seeing Return of the Jedi with my dad, Normality. My head was spinning with visions of bounty hunters, speeder bikes, and B-wing fighters. Without a doubt, Return of the Jedi was the coolest movie a kid could possibly imagine. 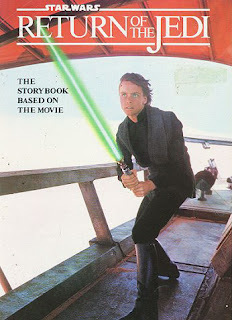 Here’s a pic of the ROTJ storybook I had as a kid. I always thought Luke’s hair looked pretty rad in this picture. This weekend I watched ROTJ with the Kyality Kids for the first time. I know, I know it’s a bit early to be showing these kids those kinda scary scenes with the Rancor and the Emperor. But I sat there and cuddled up with them during those particular scenes—and I have to admit—the Kyailty Kids are serious Star Wars enthusiasts. They were glued; they didn’t want to miss a thing. I realized it had been a while since I’d actually watched good old ROTJ. It was interesting to see how it held up over time. I have to admit—it wasn’t as bad as I thought it’d be. Granted the acting was either over the top or uncannily stale. But things like the star-fighter dogfight scene still looked fantastic. The old-school motion-control model effects are definitely better than CG in my opinion. It was really the little things that got to me. For instance, how does Luke know that Artoo would be serving drinks on Jabba’s sail barge and that he’d be able to launch his lightsaber at the perfect moment? Why aren’t Luke and Leia even squinting on the speeder bikes? 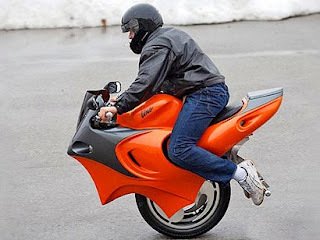 Seriously, aren’t they going like 150 mph? And when the team gets captured by the Ewoks, why the crap does Leia show up all of the sudden with a tailored hemp dress on? Aren’t they heading into battle the next day? Shouldn’t you probably stick to the fatigues there Princess? (Or at least put on the brass Jabba bra again, sheesh.) 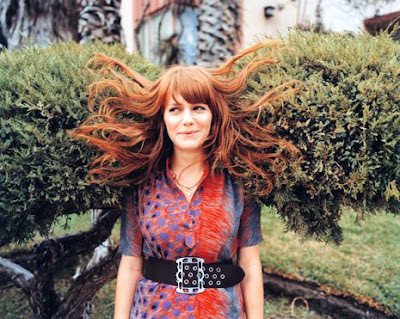 And who the crap made that hippie outfit for her anyway? Did Wicket W. Warrick just bust out a loom and whip up a quick pattern or something? Anyways. If you get a chance, go ahead and hit the Return key again for kicks. It’s good fun, and way better than the recently released Clone Wars feature. And maybe, just maybe you too can spot Luke’s glove switching hands while he’s riding his speeder bike! 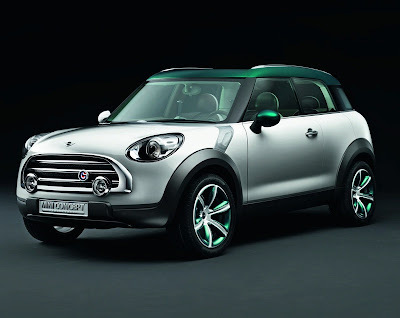 Yesterday, MINI released official concept photos of its long-rumored crossover SUV. 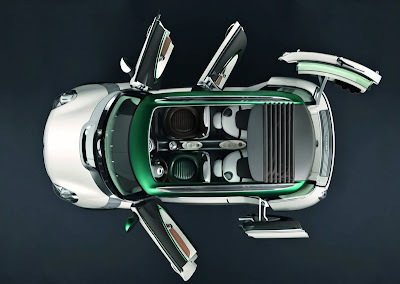 Dubbed the MINI Crossover Concept, the vehicle will be making its physical debut at the Paris Motor Show. It sports a variety of unique door arrangements, which in my opinion is an awesome way to keep folks guessing as to what the production model will finally look like. Aesthetically, I love the proportions. It looks very MINI, though it will be their largest vehicle to date. And as far as the door arrangement goes, I hope the production model, tentatively called the Crossman, will have rear doors that slide backward on both sides. (Like on the driver side of the Crossover Concept.) And I hope it has double barn doors in the back, like the current Clubman. But that’s just me. Here's a link to some killer concept sketches. My MINI sources tell me that the production version is already undergoing serious offroad tests in South America and that it will be manufactured at the same plant as the BMW X3. Wouldn’t it be so totally aws if you could choose your door arrangement as one of your options!?! On Friday night, Mrs. Kyality, who recently had our third, had to get out of the house. So she went to the movies with a friend and I was left to fend for myself with the little trio of Kyality Kids. Once the rugrats were all snoozing, I felt the need to watch a serious car flick. After perusing the personal collection and realizing I wanted to see something I haven’t seen before—I hopped on iTunes Movies. After a quick search, I settled on renting the definitive dood movie classic, The Fast and the Furious: Tokyo Drift. I had a limited amount of time to knock this one out. So it was awesome that you can actually start watching your movie before you done downloading. 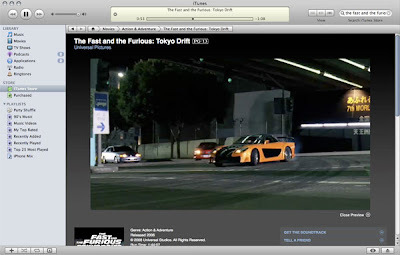 I kicked back on the couch, dual wielding my Apple Remote and my Wireless Mighty Mouse, and watched “The Drift”—as I like to call it—in fullscreen mode on our 24-inch iMac. Seriously I have to say, the image quality was fantastic. It was easily near-DVD-quality, but maybe that’s not saying much for all you Blu-ray-ers out there. All in all the convenience and quality of renting a flick on iTunes made the evening’s experience pretty awesome. Too bad I spent it watching “The Drift”. I dunno, it was more or less exactly what I expected. The characters were pedestrian, the storyline was predictable, but the driving was driftacular. It’s an interesting question posed to me by D-mode yesterday. Well, discover the answer for yourself by heading on over to Apple’s iTunes Store. There you can download all 45 minutes of pristine audio and/or video podcasts of Senator Barack Obama’s nomination acceptance speech from last week’s 2008 DNC for free. It’s definitely worth listening to and making your own call! "Many artists including Shepard Fairy have already proven that poster art is not a dead medium in the United States and have also shown how much of an impact a single poster can have. It is in this spirit Design/ers for Obama was created. With the goal of supporting Barack Obama's campaign for presidency, Design/ers for Obama will bring web-powered grass roots campaigning to visual communicators. Think Threadless, but for political poster art. That is, members create posters and upload them to be judged by the community, of which anyone and everyone is a part. But instead of selling merchandise, the best posters will be mass-produced and distributed in cities across the country to be seen by millions. 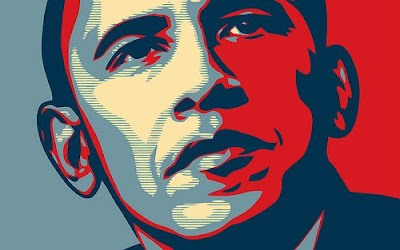 Design/ers for Obama will begin accepting poster submissions on September 4th and will hold four, two week contests in the two months before the election."